Got black spots on your roses, purple spots and yellow leaves on your photinia and Indian hawthorn, brown patch in your St. Augustine grass, damping off in newly planted seedlings or algae in your pond or water feature? You don’t have to use toxic chemicals like the synthetic fungicides such as Daconil or Bayleton or heavy metal products like copper sulfate. There’s a terrific natural solution to these problems. 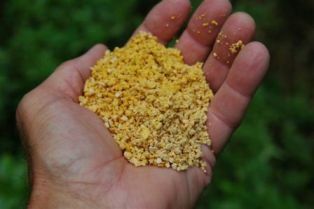 Cornmeal – and it’s available from the garden centers and feed stores. Whole ground cornmeal is the natural disease fighter that is especially good for use on fungal diseases. It’s also good to use for cleaning up algae in ponds. 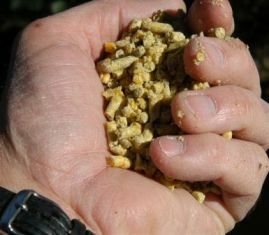 Corn gluten meal is the natural “weed and feed” product. It is the protein portion of cornmeal. Much of the cornmeal at the grocery store is just the starchy inside of the corn kernel and not effective for any of the plant uses. 1. BED PREPARATION – Whole ground cornmeal should be used at 20-40 lbs. per 1000 sq. ft. as a source of nutrients, organic matter and natural disease control. For better results, add dry molasses at 20 lbs. per 1000 sq. ft. Cornmeal can be used as the primary bed prep material or mixed with any of the commonly recommended amendments. 2. DISEASE CONTROL - Use whole ground cornmeal for root and soil borne fungal diseases at 10-20 lbs. per 1,000 square feet. Cornmeal works as a disease fighter in the soil by stimulating beneficial microorganisms that feed on pathogens such as brown patch in St. Augustine, damping off in seedlings and other fungal diseases. Use cornmeal at about 2 lbs. per 100 square feet to help control any soil borne fungal diseases on both food and ornamental crops. One application may be all that is needed, but multiple applications are okay if necessary because cornmeal serves as a mild organic fertilizer and soil builder. Cornmeal needs moisture to activate. 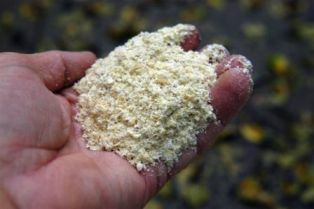 Rain won’t hurt cornmeal’s efficacy because, like all organic products, it is not water soluble. Cornmeal tea can also be used for disease control. Soak 1 cup of cornmeal in 5 gallons of water for 30 minutes to an hour, strain out the solids and spray the foliage of plants. 3. ALGAE CONTROL IN WATER – For floating paint-like and filamentous algae in water, use cornmeal at 5 lbs. per 1,000 square feet or 140 lbs. per surface acre. The cellulose in the cornmeal helps tie up the excess phosphorous in water, balances the water chemistry, and thus kills off the algae. The carbon in the cornmeal enables the beneficial bacteria in the water to flourish at the expense of the algae, then the decomposing algae provide a source of carbon for the bacteria. One or two treatments is usually enough to control the algae for several months. Getting the cornmeal to the bottom of the water increases the effectiveness. One technique is to put in a burlap bag with a rock. Small water features can use cornmeal in mesh bags. Pelletized cornmeal is good because it sinks. Caution: any fast algae kill from any product can cause oxygen deprivation and result in fish kill. Cornmeal from the grocery store (unless whole ground) is just the starchy endosperm of the corn kernel and not as effective. 4. COMPOST STIMULATION – It should be used at 1 lb. per cubic yard of compost to stimulate beneficial decomposing microbes in order to neutralize contaminates or just speed up the composting process. This material can be used at much higher rates for accelerated results. 5. WEED CONTROL – Corn gluten meal (as opposed to cornmeal) is a powerful “Weed and Feed” fertilizer and is available in powdered and granular forms. The granular is less effective, but much less messy to use. Broadcast at 20 lbs. per 1000 sq. ft. before weed seeds germinate in early spring and fall. It not only helps control weeds, but it is also an excellent organic fertilizer with an analysis of almost 9-1-1. For best results, it should be watered in after application and then go through a dry period. It can also be used in containers for feeding and weed control. 6. HUMAN FUNGUS SOLUTIONS – Organic fungus control for toenails, skin problems, etc. View the video of cornmeal information.